I never tried Brussels sprouts as a child and I can’t recall if I have anything but shaved Brussels sprouts and I’m not going to lie I love them. I’ve heard that the reason why people hate Brussels sprouts is that they are easily overcooked. In my experience using the shaved version makes it easier to know avoid that problem. Plus bacon makes everything delicious and you don’t even need to use that much. Love this as an easy lighter side that can be made up super fast. Cook up the bacon. Leave about 1 tsp drippings. Pan fry the Brussels sprouts in the drippings. This should only take a couple minutes max. You don’t want them soft or musshy. Top with (or mix in) crumbled bacon and serve. Hmmm I too have never had a brussel sprout! Maybe 45 years later I will try this recipe!! I never knew they sold shaved brussel sprouts. That makes things so easy. 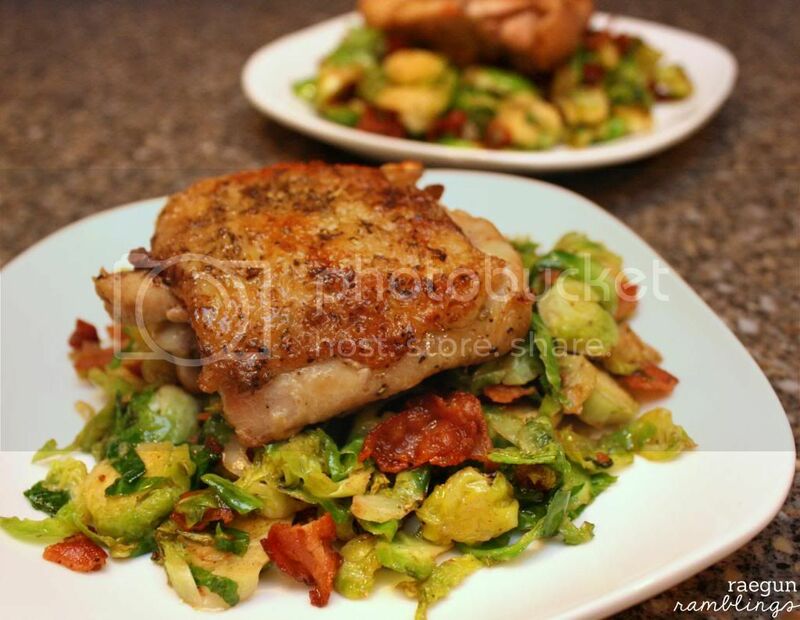 I have never made brussel sprouts with bacon and I can’t wait to try this. Just pinned this to my Eat Your Veggies board. Does shaved brussels sprouts mean they are cut already? This looks yummy! oh the addition of apples sounds delicious I’m going to have to try that! I’m actually making Brussels sprouts tonight. thanks for the inspiration! I always make them different every time… think I’m making up for lost time since I never had them as a kid either. I love brussel sprouts. This looks delicious. Thanks so much for sharing at Wednesday’s Adorned From Above Blog Hop. 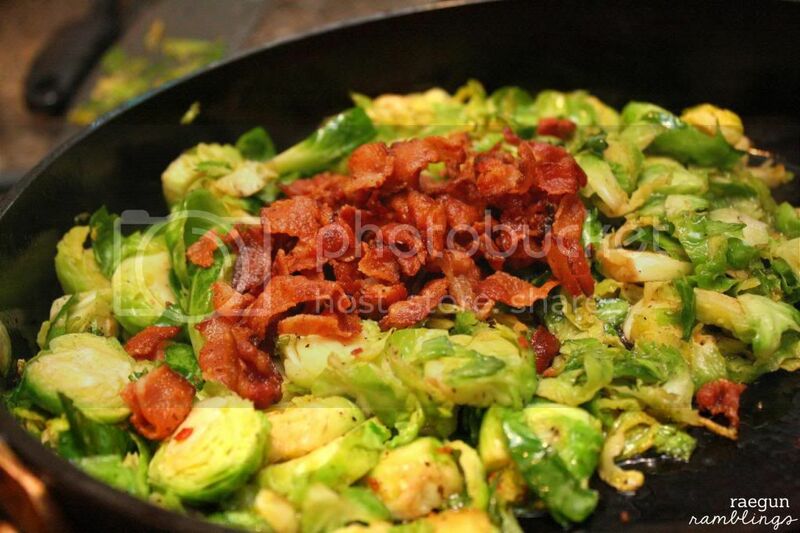 A little bacon makes all vegetables appealing… delicious looking meal. Oh yes my favorite dish!! Stopping by from Pin Me :) stop by if you have a moment Running Away? I’ll Help You Pack! Brussels Sprouts were our ‘holiday’ veggie growing up…like Christmas, Thanksgiving and my birthday if I was lucky! I LOVE ’em! I was recently taken out to dinner for my birthday to a VERY fancy steakhouse and this is the side dish I ordered! Yum-my! Thanks! 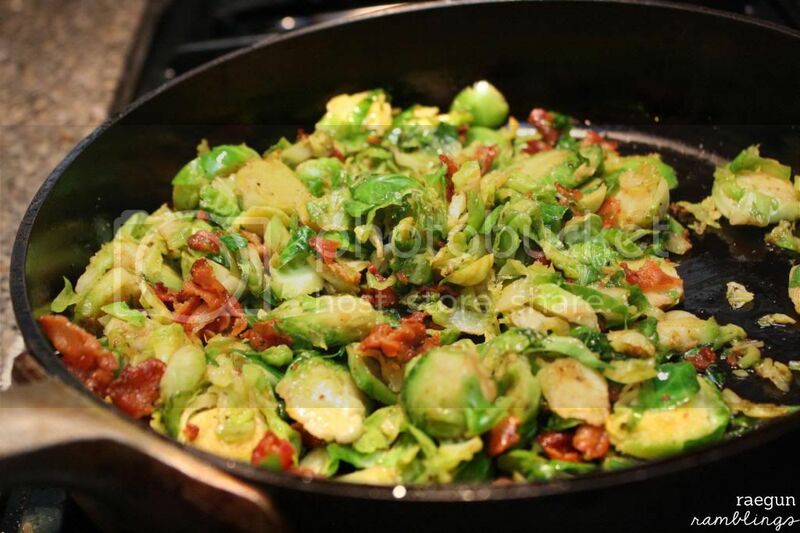 MMmMM – I love brussels sprouts with bacon – it’s the best!! Thanks for sharing this recipe at Romance on a dime!